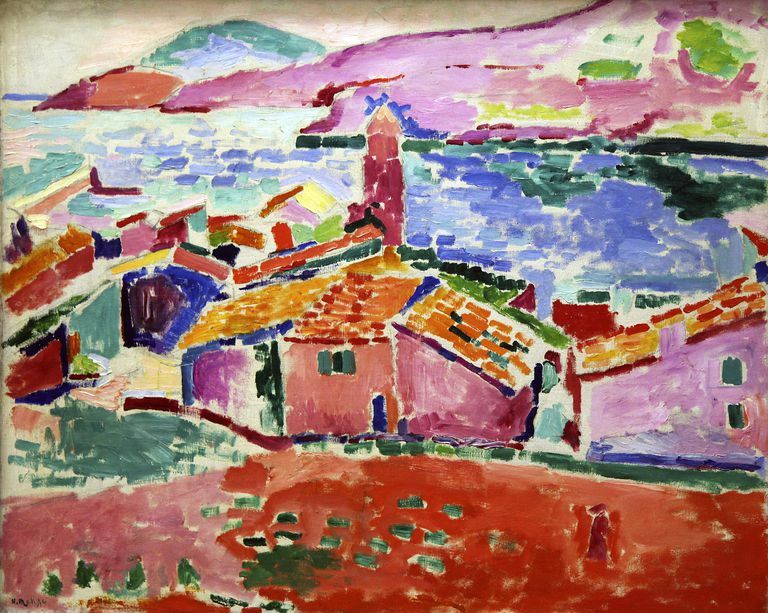 Fauvism was a style of painting in the early 1900s that emphasized bright, expressive color, ordinary subject matter, and simplified forms. The term, fauve, actually means "wild beast" in French. The painters who painted in this manner were called this because their approach to painting was so uncontrolled and untamed compared to the art that preceded it. The Fauves were influenced by painters such as Cezanne, Gauguin, and van Gogh, who also simplified their paintings into either planes or flatforms, or used energetic and expressive bright colors. Some Fauves include Henri Matisse and Andre Derain, Raoul Dufy, and Maurice de Vlaminck. Not all the Fauves painted with the same brushstroke, though. Some, like Matisse, favored larger areas of flat color, some, like de Vlaminck, used short strokes of thick paint. Paint everyday scenes or landscapes. For portraits look at those done by Henri Matisse, such as Green Stripe, done in 1905. Use bright, saturated colors. Mixing colors to tone them down is not required. Straight from the tube is encouraged. Don't worry about creating the illusion of deep space. The Fauves were less concerned about space than using color expressionistically for its emotional content. Because the colors in a Fauve painting are of similar saturation or intensity, the pictorial space appears flatter, with objects seeming to be closer to the surface of the painting. Remember that warm colors such as red, orange, and yellow tend to come forward in a painting, and cool colors - blues, greens, purples - tend to recede. Use this effect for defining form - use warm colors in the highlights and cool colors in the shadows. This will help your painting to read a bit more three-dimensionally. You can also use warm colors for the foreground and cooler colors for the background. Use complementary colors next to one another. This is very dynamic and creates visual impact and focus. Don't blend your brushstrokes. Make them visible, bold, and energetic. Simplify. Do not feel the need to paint every detail. Edit out what it is not critical to the emotion of the painting. For example, faces close up just marks, faces in a crowd are featureless. Outline many of the shapes in black or blue. Don't feel like you have to fill in every space on the painting surface. Use a decisive and energetic stroke that may or may not reveal the painting surface between the strokes. Whatever your medium, painting like a Fauve will certainly brighten your palette and may inspire further exploration into this expressive way of painting.